Galco V-Hawk IWB Inside the Waistband Holster FREE SHIPPING! Durable, discreet and incredibly comfortable, the V-Hawk IWB Inside the Waistband Holster from Galco is the perfect concealed carry holster. Constructed from genuine steerhide leather, it is guaranteed to withstand the harshest and most extreme field conditions. Built to deliver the quickest, most natural draw possible, the V-Hawk features wide-set belt loops for improved stability. Additionally, its open-top design ensures there is nothing for the pistol catch on during a draw. The reinforced mouth holds its shape, making one-handed reholstering smooth and effortless. 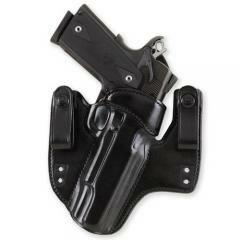 The holster comes with two C-hooks to allow it to rest deeper inside the pants, further increasing concealment. Galco does not use oneway snaps on the belt loops for this holster, This is definitely a safety hazard, when drawing your weapon from a holster. This is my 2nd V- Hawk. The first one is for my Kimber Master Carry Pro (4"). I like these holsters alot. They must be broken in. Really tight at first. Good for all day wear. Fast free delivery. Very nice holster but would not block properly according to instructions included with the item. I'm hoping I just got one that made it past quality control but it would not draw properly (too tight) and would have been useless if I needed to draw my weapon in a real situation. Will this fit my smith-Wesson model 60 357 with 2" barrel revolver? Does it have sweat guard on other side? Yes it will fit and it does have a backing against your body. ©2002-2019 CopsPlus.com: Galco V-Hawk IWB Inside the Waistband Holster FREE SHIPPING!